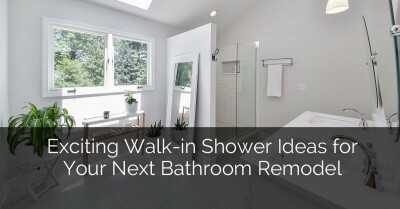 There are lots of design elements to consider when remodeling a bathroom. 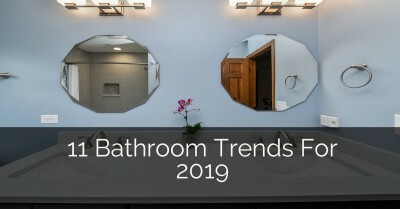 In this article, we’ll focus on different bathroom faucet styles and functions as well as maintenance and lots of other things you need to consider. 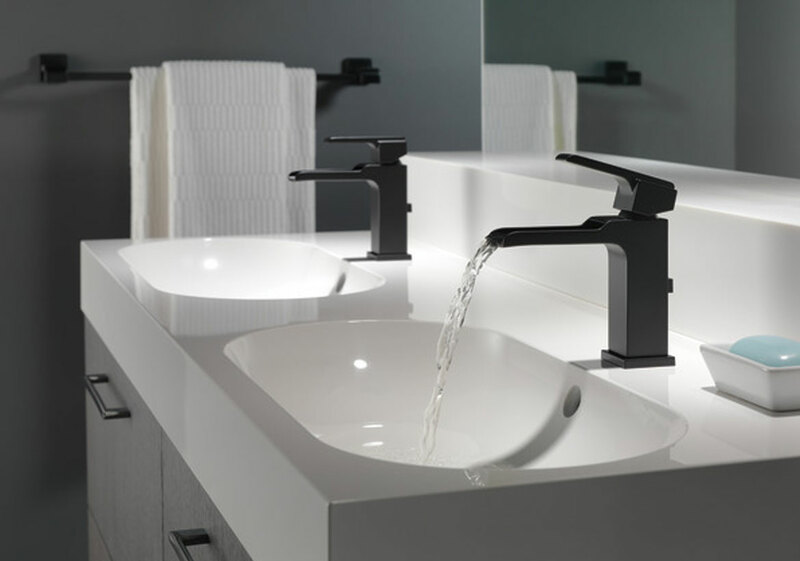 As well as being visually appealing, bathroom faucets should be easy to use–fitting effortlessly into the overall aesthetic of your bathroom. 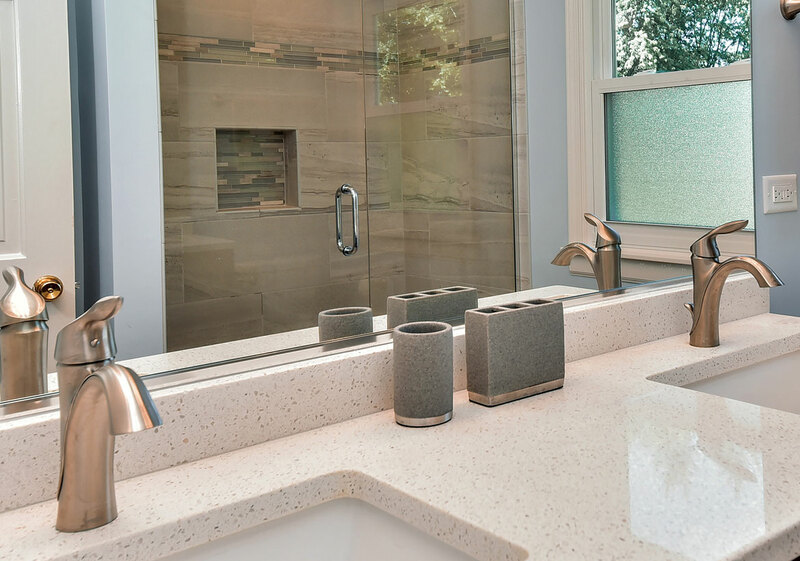 From how the faucet functions to the finishes available; this article provides a comprehensive functional overview of selected bathroom faucet options available on the market. 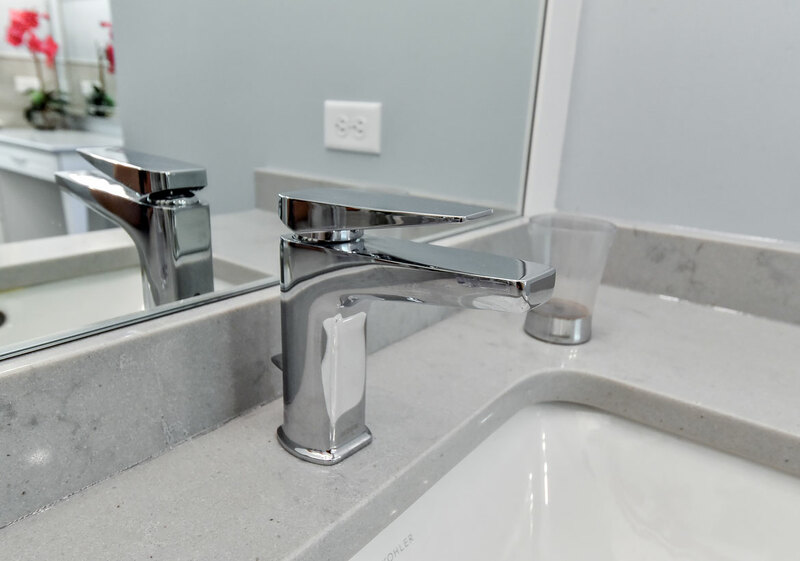 We all get excited about how the bathroom faucet will look, however, we need to spend a little time to consider how the faucet functions and how long it will last. Compression – Faucets with compression valves usually consist of individual hot and cold handles. These valves control the flow of water by means of a screw-like feature in the handle that compresses a seal (rubber washer). A compression valve is considered the simplest form of faucet valve and can require maintenance sooner than other types of valves. Ball – Ball valves are used with single lever faucets. Ball valves don’t use washers like compression valves. The ball valve has slots in it that control the mixture and the amount of hot and cold water that’s allowed through the spout. Moving the handle changes the position of these slots within the valve which regulates the flow. Cartridge – Cartridge valves are considered extremely durable. Cartridge faucets operate with a movable stem cartridge that moves up and down to regulate flow. You can remove the cartridge and install a new one if it starts to leaks. Cartridge valves have a hollow sleeve that is attached to the water supply that moves inside another sleeve. Movement of the faucet handle moves these sleeves relative to each other, aligning or blocking holes that control the supply of water. Cartridge valves have fewer moving parts than a ball valve but their seals can wear out and need replacement. Ceramic Disc – Ceramic disc valves are also considered very durable. Faucets with this valve type usually consist of a wide cylindrical body and single lever. They have a wide cartridge housing and two ceramic discs that slide over one another to control water flow and temperature. The motion between the two disks controls the flow of water by opening or restricting the pathway for the water. The hardened ceramic material is a durable and resists corrosion and wear. Ceramic valves and cartridge valves are repaired/replaced using similar methods. Ceramic disk valves are considered the most durable and longest-lasting type of faucet valve. With that said, ceramic disc valves will be the most costly. 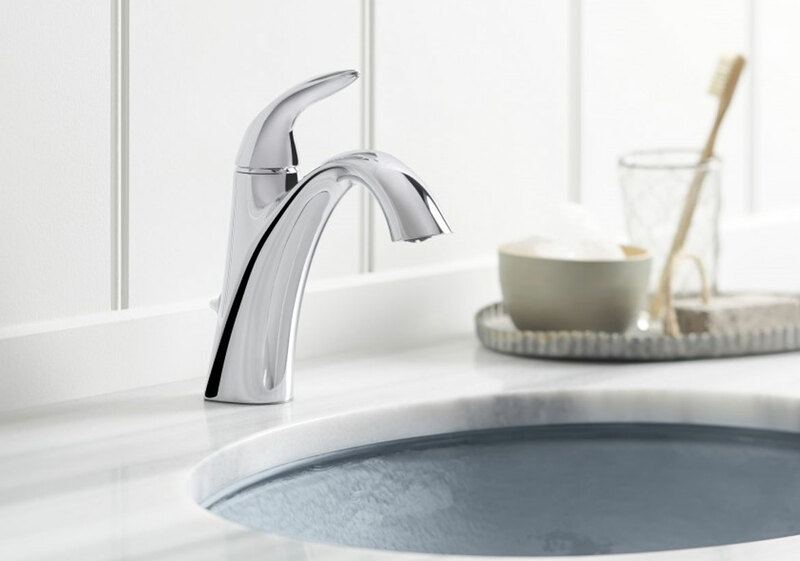 Your bathroom faucet should last a lifetime, so make sure you choose a faucet that will be stylish and functional. 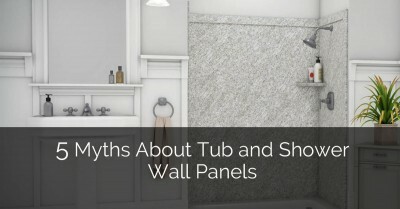 In this section, we’ll discuss the different bathroom faucet styles available. 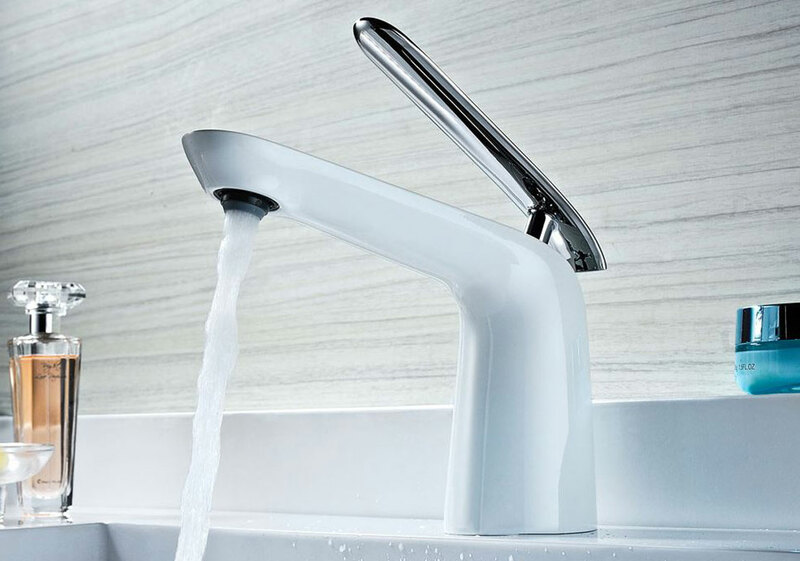 A single handle adjusts the water pressure and temperature. A single hole faucet can adapt to a sink with three holes if an escutcheon plate is added. A centerset bathroom faucet is designed to fit sinks with three faucet holes that measure 4” from one side to the other. This is a great choice for smaller vanities. The handles and spout are all one piece. A widespread bathroom faucet is designed to fit sinks with three faucet holes that measure 8” to 16” from one side to the other. These faucets consist of three separate pieces. 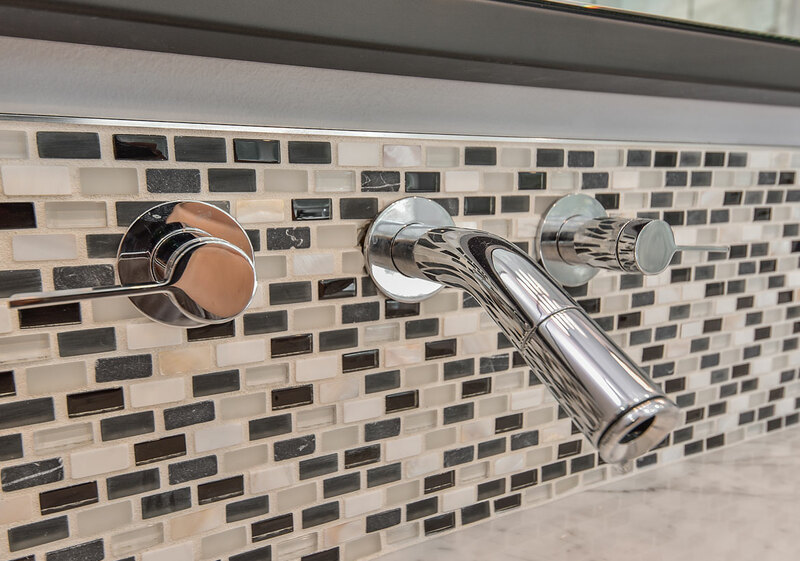 A more expansive area is needed to accommodate this faucet choice. A wall mount faucet is commonly chosen if you have a vessel or under-mount sink. Chrome is a shiny finish with cool blue tones. 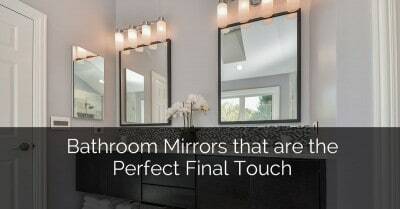 They’ve become more popular over the last 70 to 80 years because they fit well with sleek, minimalist bathroom designs. The best quality chrome faucets will be durable, tarnish resistant and low budget. Nickel can be polished, brushed or hammered, giving it either a shiny or matte finish. Like chrome, polished nickel is gleaming – but it has a warm golden hue instead of a cool blue. With this color, accessories should be warmer earthy tones of orange, green and brown. 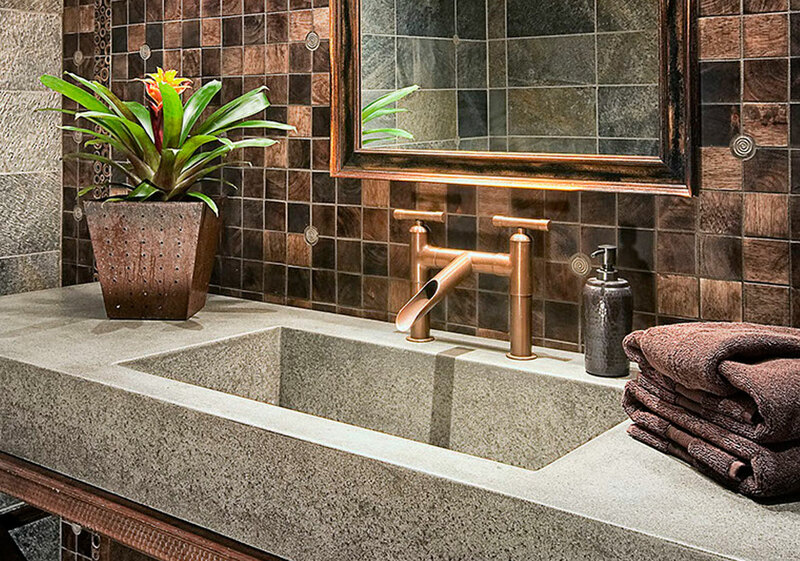 Brushed nickel, sometimes called pewter will bring a softer tone to your basins and tubs. Because nickel can be hard to maintain over time, it requires regular polishing to keep it from losing its luster. 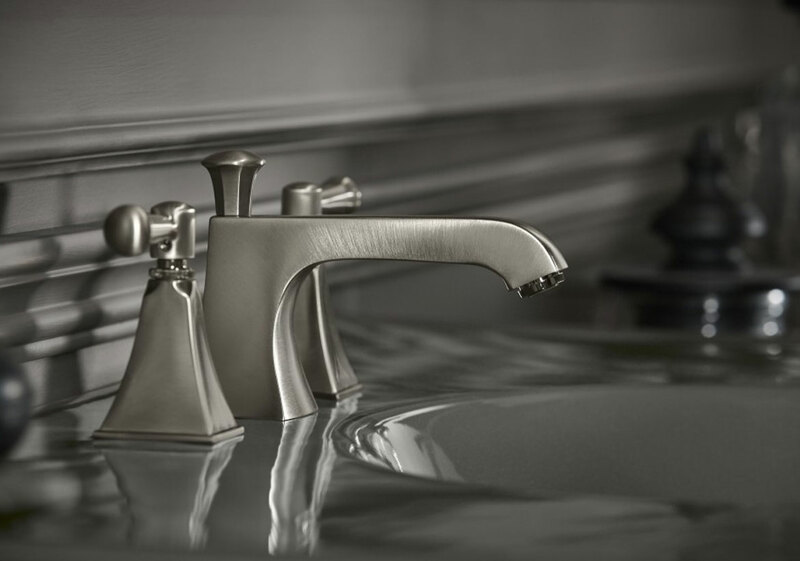 If you’re choosing a nickel finish for your taps, brushed nickel might be a better choice – it’s more tarnish resistant than polished. Stainless Steel is known to have antibacterial properties, so it’s a wise choice to consider when thinking about the long-term maintenance of your taps. Like chrome, it too is shiny, but it is a more luxurious alternative, being longer lasting and hard wearing. Oil Rubbed Bronze is traditional, dark, rich and durable. Can be a little more expensive than chrome or brushed nickel. 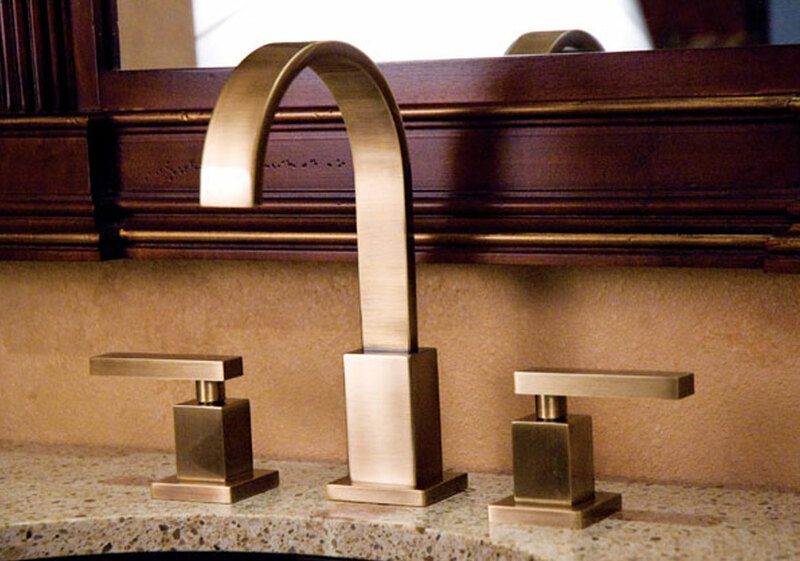 Brass gives a more traditional look, but can be paired with a modern sink for a contemporary look. 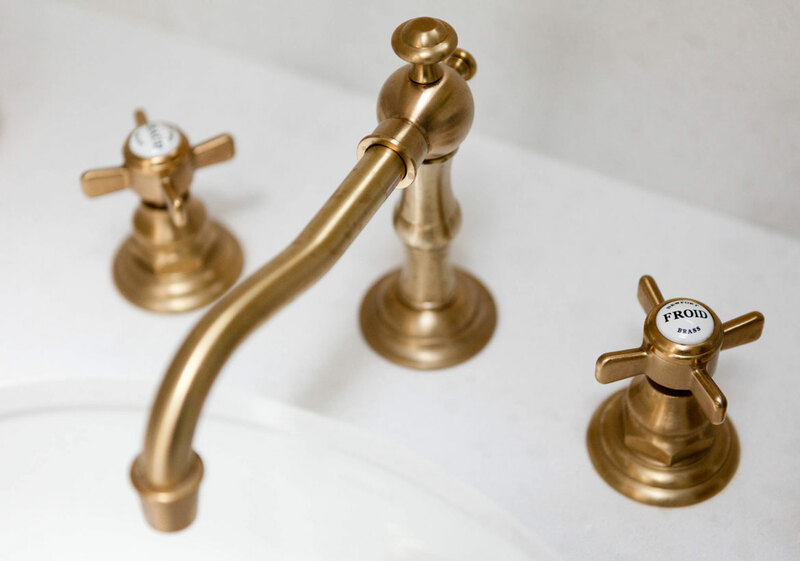 If your bathroom has a wooden theme, polished, brushed or hammered brass will complete the Victorian, vintage look. Matte Black is just seeing increased popularity, so finding coordinating accessories may be difficult. This style definitely leans more modern or eclectic. Copper is very unique. Requires a little more maintenance. Most individuals that choose this special finish let it develop a natural patina as it ages. You will most likely see in farmhouse or Tuscan designs. White is another very unique choice but can be a very clean and fresh look. Easy to clean and won’t show water spots and fingerprints like other finishes. However, if the faucet is porcelain–porcelain can chip. 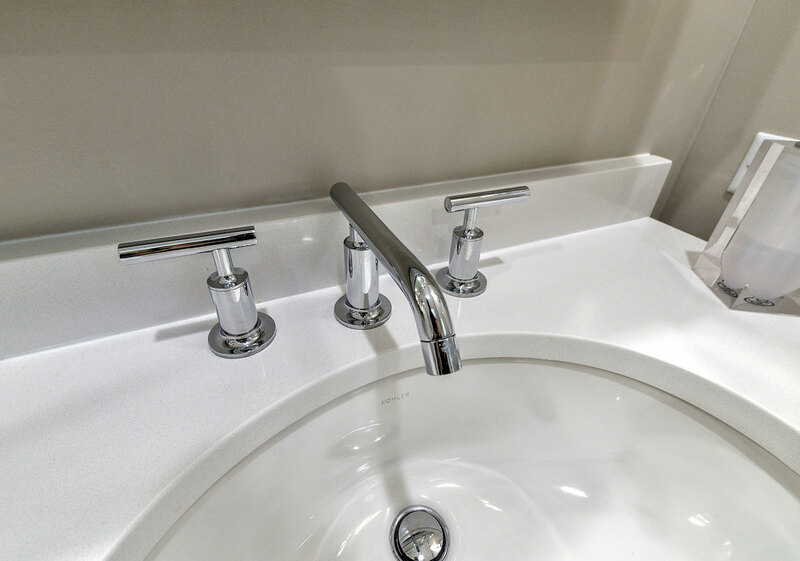 You will most likely see white faucets in modern or farmhouse bathrooms. Look for a bathroom faucet with a PVD finish. PVD stands for “physical vapor deposition”. This is the process for how the coating gets on the faucet’s surface. PVD finishes are scratch resistant and very durable. 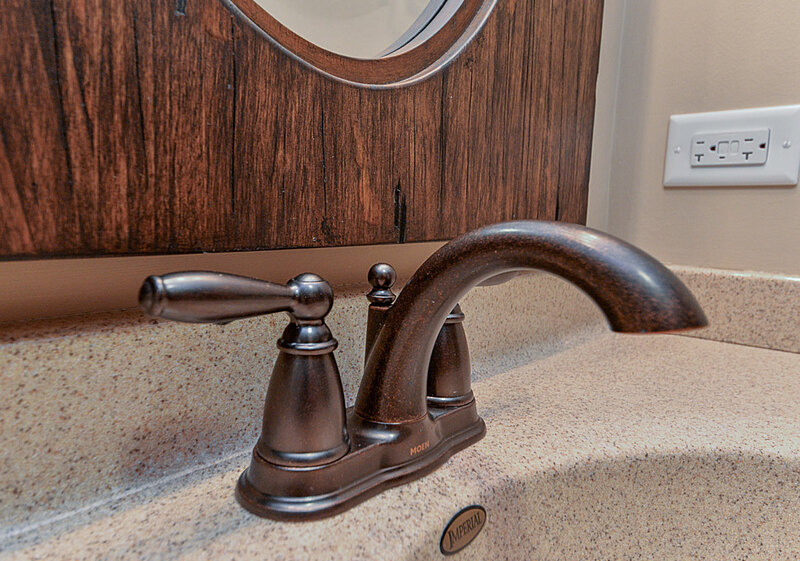 Be aware that some bathroom faucet finishes do not have warranties. 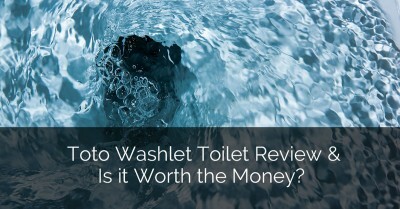 Ask questions before you make your final bathroom faucet purchase. 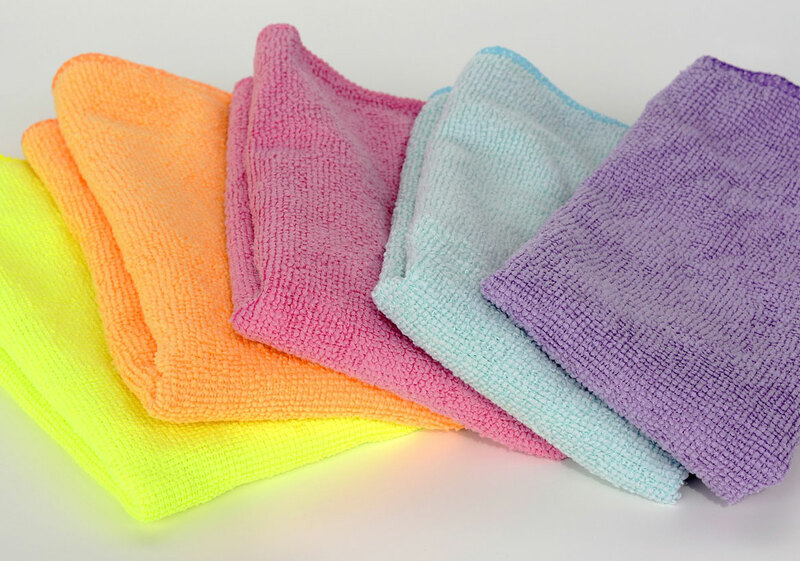 Clean your faucets regularly with a soft microfibre cloth after each use to keep them looking brand new over time. Every two to three weeks, wipe your faucets down with a solution of lemon juice and water to remove limescale, soap scum and grease. When using harsh chemicals (like bleach) near your faucet fittings, avoid letting them touch the faucet. If they do, wipe them off immediately. Avoid hanging wet towels on your faucets, prolonged dampness can lead to corrosion over time. Always completely rinse off residue from soap, toothpaste, creams and other personal hygiene products. 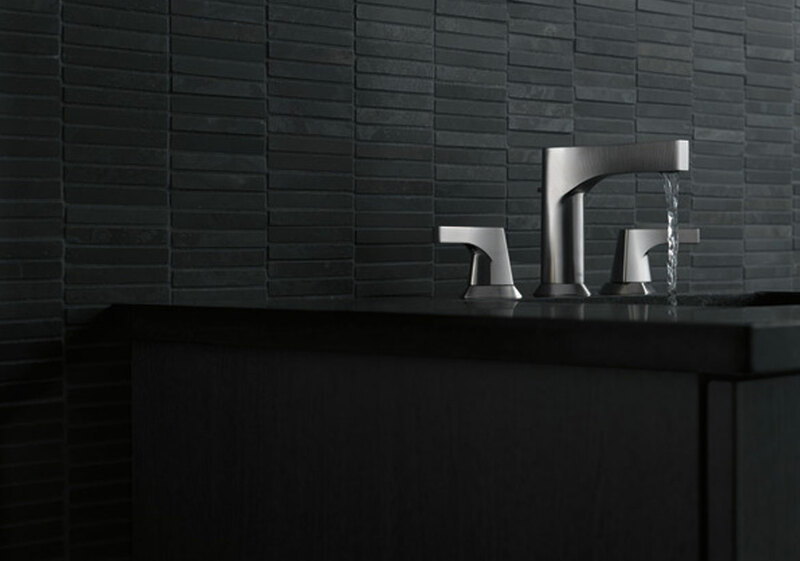 Spout Height – Most of the time the area above the sink is clear and you will have no limitations. However, consider if there are shelves or cabinets above the faucet area before you make your final choice. Handles & Drain Levers – All models don’t necessarily come with handles and drain levers. Make sure what you order has everything you will need. Sink Choice – If you can choose your sink & faucet at the same time, it will most likely make your life easier. This way the holes and space needed will be compatible with each other. 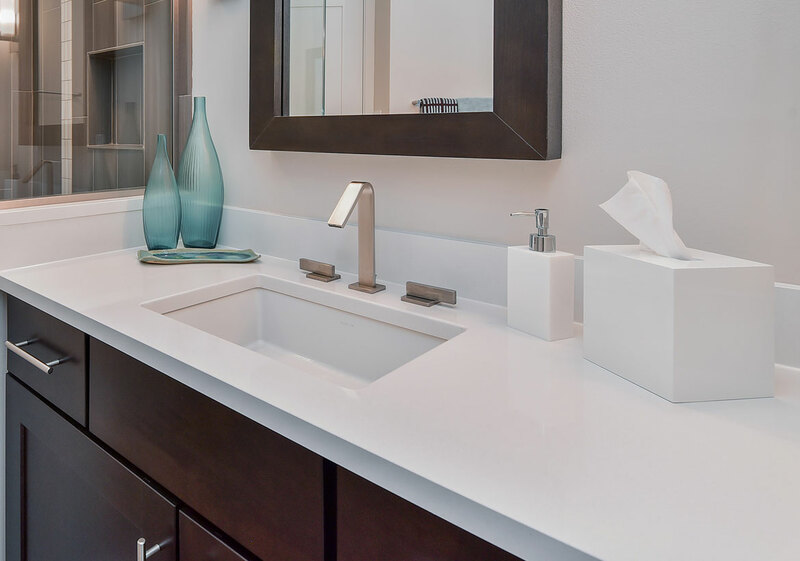 Space & Thickness – What overall size is available and what are the limitations around the faucet area? Don’t forget to consider the thickness of your countertop. Ease of Maintenance/Lifestyle – Consider how this bathroom will be used and if the finishes you choose will be easy to clean and maintain. Water Pressure – When fitting new faucets it’s important to check that your water pressure is suitable. Different faucets work better with different pressure rates. Mixer faucets, in particular, need high-pressure rates to function as they should. Mixer faucets typically have one sprout. Hot and cold water are mixed in the body of the faucet, while the flow and temperature of the water are controlled by one or two separate handles. They mix the hot and cold water as it’s released from the spout, allowing you to have more control over the temperature.The pressure of flow to the faucets in your home depends on whether you have a gravity fed water system, unvented hot water system, or a combination boiler that feeds hot water to your taps. Ask your bathroom installer or builder to check your water pressure to help inform your decision. Price – Finally, price. It isn’t cost-effective to buy a cheap faucet, just because it’s cheap. You need to consider the long-term benefit of buying a better quality faucet from the start otherwise, you’ll need to replace them sooner rather than later. Causing you to spend more money than you ever intended. 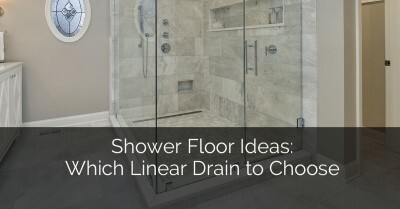 If you’re working with a tighter budget for your new bathroom project, work out a way to save money in other areas. Your faucets will be the most used fitting in your bathroom so they need to be hard wearing and high quality. Try to purchase from a manufacturer that provides a decent warranty of at least five years. 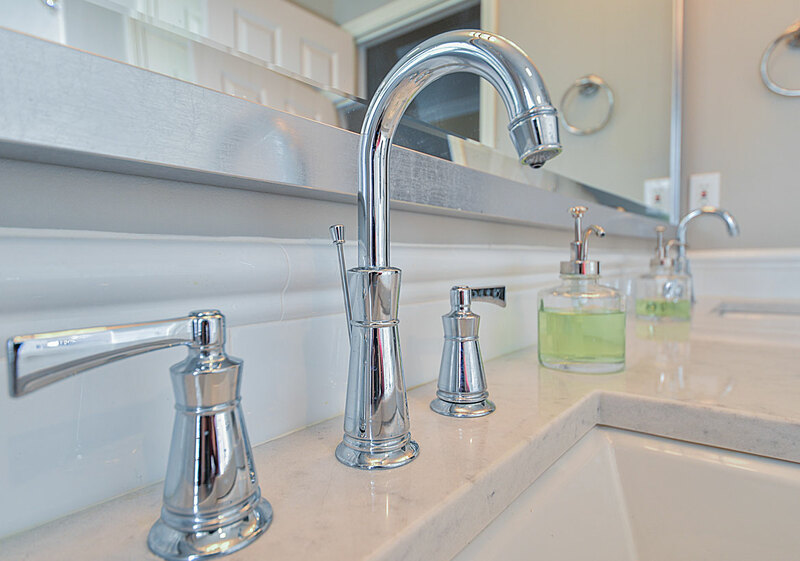 Lead Time – Consider the lead time of the faucet you choose to order and how it will affect the schedule of your project. 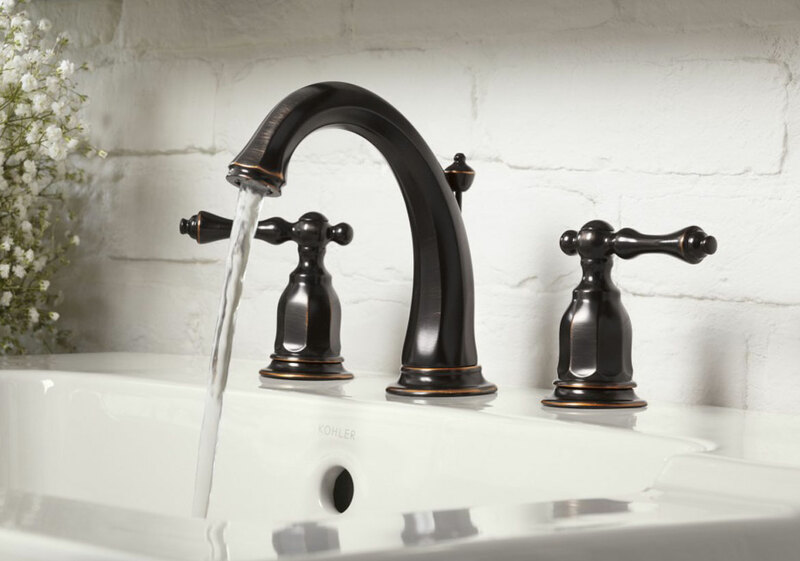 Some faucets and fixtures are not as readily available and take longer for delivery. We hope this comprehensive guide is useful to you as you make your choices. It’s by no means exhaustive, there is a world of choice available when it comes to installing the best fittings and faucets in your bathroom. The most important thing is to do your research with diligence because you will have to live with your choices for a while. Bathroom Faucets are available in wide variety only at faucets complete. We provide the best in class and quality product at a very reasonable cost with quality assurance. Firstly, thanks for sharing this amazing and useful post. It’s really an absolutely good guide. I read so many useful things about your article and I enjoy it. Sebring, this is an incredibly great post. Just to add to the idea of the configuration, I think it is good that you consider the dimensions of the bathroom sink before choosing the faucet. This could be the case when you want to replace an old faucet and you already have a bathroom sink installed. On the flip side, if you just want to install a bathroom faucet for the first time, it would be recommended that you think about the dimensions of the sink that you want to purchase. This will help you to choose a bathroom faucet that is compatible with your sink. In some cases, you might require a bathroom faucet which is two-levered. Such a choice has to be compatible with the available sink type. Remember holes are already created in the bathroom sink and you will just require to install your faucet. Thus, the decision to choose the faucet should be based on the type of the sink that you have at your disposal or the one that you are planning to buy. On the other hand, you can still choose your faucet of interest and let it be the basis upon which you decide to buy a bathroom sink. 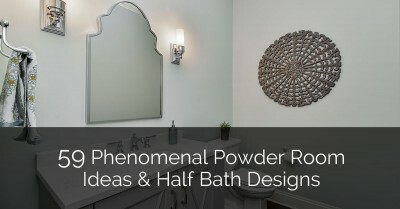 There is a great list of bathroom accessories. Love your list and follow your advice. 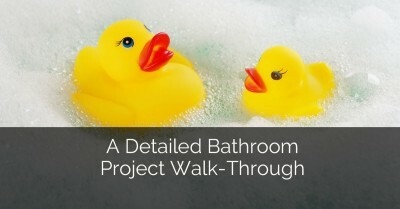 A great explanation of bathroom remodeling blog. Thanks for sharing this awesome and informative post. I like the tip that you gave to use microfiber towels to clean your faucet. My wife and I are remodeling our bathroom, and we want to make sure that we can properly clean it. 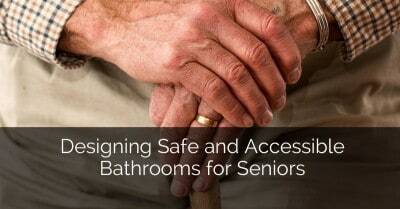 I will be sure to use microfiber towels, so I can be confident that I am taking proper care of my bathroom.